The Inspire 2 is perhaps the finest flagship-level drone in existence today, and offers market-leading safety functions, incredible build quality, great app functionality and stunning optics – the latter of which can be upgraded as time goes on, protecting your initial investment. However, the cost of that investment is the biggest sticking point. The DJI Inspire 1 made quite a splash when it first launched, offering a raft of cutting-edge features and the ability to swap out the camera lens depending on your shooting goals. It’s still one of the best drones around, but the market is evolving – and that’s where the Inspire 2 comes in. While it looks very much the same as the previous Inspire model, this new drone is packing a wide range of enhancements under its hood. It’s even better at avoiding obstacles, and ships alongside a new Zenmuse camera, the X5S. It also has a dual battery setup for increased stamina. DJI’s rivals have upped their game in recent years, but the Inspire 2 is a different proposition entirely, and comfortably leads the manufacturer’s range of flagship, professional-spec drones; the more frugal amongst you will be disappointed to learn that it costs a lot more than the company’s more consumer-focused Spark, Mavic and Phantom lines. The base unit costs around £3,000 / $3,000 / AU$5,200, but once you factor in the latest Zenmuse X5S camera you can expect that price to rise to around £6,000 / $6,200 / AU$10,700 depending on the retailer and what other items they choose to bundle with it. If you opt for the older X4S camera then you’ll still get quite a bit of change from £4,000 (approximately AUD $6,750, USD $5,120), so it depends on how serious you are about getting the best possible package. The Inspire 2 is available direct from DJI in a wide range of territories, or from multiple specialist retailers both online and on the high street. If you’re familiar with the DJI Inspire 1 then the Inspire 2 won’t come as too much of a surprise, at least in terms of looks. It retains the same quad-prop layout as its forerunner, and once again utilizes super-tough carbon fiber material for the arms, giving the drone impressive strength. DJI has revised the bodywork, too; gone is the white plastic of the previous model, and in its place we have a rather fetching magnesium aluminum composite. Another major change is the introduction of a new forward-facing FPV camera and obstacle-avoidance system, mounted in a bar on the front of the drone, and there’s also a dual-battery setup for increased stamina. The net result is that the Inspire 2 looks even more like something that Skynet has sent back in time to kill John Connor than its predecessor. The drone itself doesn’t have a camera attached, but you can pick one from DJI’s range of Zenmuse cameras (the one shipped with our review unit is the X5S). It’s possible to swap the camera out so that you have the right lens for the job at hand, making this the ideal device for professional photographers and video creators who need complete control over their shooting setup. The original Inspire 1 was built like a tank, but the Inspire 2 is even tougher thanks to its revised aluminum shell. The carbon fiber arms mean bumps and bashes won’t damage the unit, with the only weak spots being the plastic, quick-release propellers – which are easily replaceable should they get damaged – and the camera itself, which is also replaceable, although at a much greater cost. The build quality is almost irrelevant, however, because of the sheer number of countermeasures DJI has included in the Inspire 2. The aforementioned FPV camera and obstacle-avoidance system track for incoming objects 30 meters ahead, while the upward-facing infrared sensors scan for objects five meters above the drone, which is handy when you’re flying in enclosed spaces. Terrain detection sensors fitted to the bottom of the Inspire 2 round off the package. The upshot of all this tech is a drone which is (almost) impossible to crash; it’s intelligent enough to avoid bumping into trees or smashing into the ground, although it’s worth noting that with the full suite of object avoidance features enabled you’re limited to a top speed of 45mph – should you feel confident enough, you can disable these to achieve speeds of around 58mph. If your enthusiasm gets the better of you and you allow the drone to fly out of sight, the ‘return to home’ function means you won’t end up flushing your £6,000 investment down the toilet by accident. All these features notwithstanding, it’s worth noting that the Inspire 2 is one of the most agile drones we’ve had the pleasure to test. Not only is it lightning fast, it’s quick to respond to user input and – when in the air – is as rock-steady as they come, even in moderate wind. As was the case with the Inspire 1, the Inspire 2 is controlled with a dedicated remote that links to the drone via a powerful pair of antennae. There’s no screen, so you have to connect your Android and iOS smartphone to the remote via a wired connection – you also need to install DJI’s GO 4 app, and not the DJI GO app used with the Inspire 1 and other, older DJI models. Once you’re in the app you can perform tasks such as calibrating the camera, toggling beginner mode on and off (which limits the distance the drone can travel from its starting point) and much more besides. It’s also possible to access the drone’s automated flight modes, one of which – Spotlight Pro – allows you to track moving objects with unnerving accuracy. While other drones have boasted this ability, Spotlight Pro is a real step above anything else on the market. 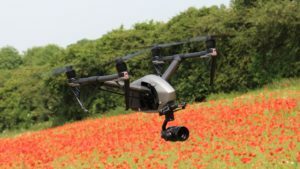 According to DJI, it utilizes “advanced visual tracking algorithms” to stick to moving objects like glue, offering up the kind of images and footage that would, in normal circumstances, require a second camera operator to capture (which, incidentally, is also an option with the Inspire 2 – it’s possible to have one remote controlling the drone while a second ‘slave’ remote controls the camera). Spotlight Pro is available in the TapFly, Waypoint, and Point of Interest ‘intelligent flight’ modes , and is an incredibly potent addition to the Inspire 2’s already impressive arsenal of features. Battery life is always a concern with drones, and when you consider all of the additional tech that has been thrown into the Inspire 2, you’d be forgiven for fretting about the impact on stamina. However, DJI has thought of this, and has included a dual-battery setup which boosts your flying time to around 25 minutes. Naturally, this figure will vary depending on how hard you’re pushing the drone – we got over 25 minutes during a gentle flight – but it’s a solid benchmark to work to. Charging both batteries simultaneously is easy using the bundled charger – this has four slots in total, so you can purchase more batteries and keep them topped up at all times. DJI’s Zenmuse line of cameras has grown alongside its range of drones, and the latest offering – the X5S – has been designed with the Inspire 2 in mind. A Micro Four Thirds snapper, it has a bigger sensor than previous iterations, which means more detail and more vibrant colors. It really is like having a high-end professional stills camera in the air, enabling you to take some truly awe-inspiring static images. When it comes to video, the Inspire 2 – when twinned with the X5S – creates a setup which most industry professionals would be envious of. 4K might be big news with other drones, but this bad boy can record in 5.2K, albeit at 30 frames per second. 4K is possible at 60 frames per second, and you can scale down to 720p if you wish – although when the footage is this good, heaven knows why you’d want to. The Inspire 2 is a joy to fly, with great responsiveness, incredible speed (even with the object avoidance systems switched on) and good stamina, thanks to its twin battery configuration. The DJI GO 4 app is packed with features, including some excellent automated flying modes, and if you buy the Inspire 2 alongside the Zenmuse X5S camera you’ve got one of the best aerial image and video capture devices money can buy. We grumbled a bit at the price of the Inspire 1, but the Inspire 2 is a whole new world of expensive. You’ll need to spend around £6,000 / $6,200 / AU$10,70 to get the setup we’ve reviewed here, and when you consider that many people might not even spend that much on a car, DJI’s flagship offering is going to be totally out of reach for most casual users, making it a drone aimed almost exclusively at industry professionals who will see a return on that investment. The original Inspire 1 was an impressive piece of kit, but the Inspire 2 outperforms it in practically every respect. The design has been improved, with cheap-looking plastic being replaced by metal composite bodywork, while the vastly superior object avoidance tech means you can breathe a little easier as your expensive investment takes to the skies. A twin-battery arrangement gives more than 25 minutes of flight time, while the ability to swap camera lenses to suit your shooting goals will make this very attractive to serious photographers and video creators – it also ensures the drone is future-proofed to a degree. Add in a fantastic and fully-featured smartphone app and dedicated remote control and you’ve got a truly epic piece of kit – but the price tag for the best package will put it out of the price range for casual drone users. If you’re not too concerned with the enhanced object avoidance tech and 5.2K video recording, it might be wiser to consider the aging (but still great) Inspire 1 or the DJI Phantom 4, both of which can be purchased for a fraction of the cost without sacrificing too much essential functionality.